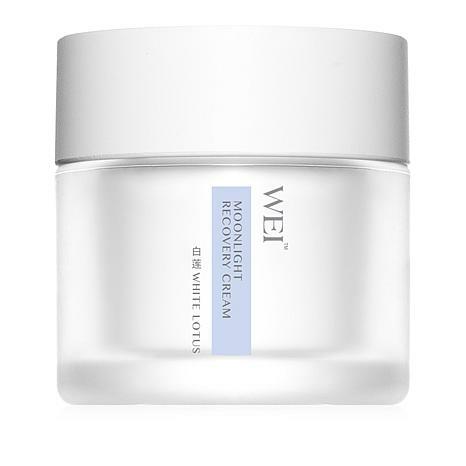 This sumptuous overnight cream is rich in Chinese white lotus and angelica extract. It diminishes the appearance of fine lines and wrinkles. 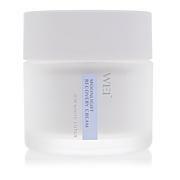 WEI WHITE LOTUS CREAM 1.7 oz. Ingredients: Aqua\Water, Petrolatum, Isostearyl Stearoyl Stearate, Isocetyl Stearate, Butylene Glycol, Glyceryl Stearate, Stearic Acid, Glycerin, Ozokerite, Tromethamine, Dimethicone, Nelumbo Nucifera (Lotus) Stamen Extract, Lilium Longiflorum (White Lily) Bulb Extract, Nelumbo Nucifera (Lotus) Germ Extract, Glycyrrhiza Uralensis (Chinese Licorice) Root Extract, Ganoderma Lucidum (Reishi Mushroom) Extract, Angelica Acutiloba (Chinese Angelica) Root Extract, Glycine Soja (Soybean) Seed Extract, Carbomer, Methylparaben, Propylparaben, Polysorbate-60, Polysorbate-20, Sorbitan Stearate, Parfum\Fragrance, Benzyl Benzoate, Benzyl Salicylate, Butylphenyl Methylpropional, Geraniol, Hexyl Cinnamal, Hydroxycitronellal, Hydroxyisohexyl 3-cyclohexene Carboxaldehyde, Linalool, DMDM Hydantoin, Disodium EDTA, Xanthan Gum. THIS PRODUCT WORKS BEAUTIFULLY ON MY SKIN. WORTH EVERY PENNY!!! 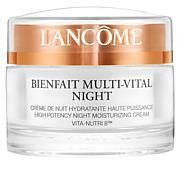 Started using this product over a month ago -- LOVE IT as a night cream -- my skin feels super hydrated and have had no sensitivity issues which I have experienced with other products. Just ordered a second jar -- would definitely recommend to all!! 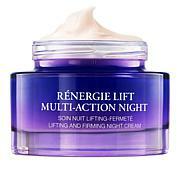 Really surprised by any negative reviews; This cream is absorbed immediately and keeps my skin soft and hydrated. Maybe others are using too much at one time? 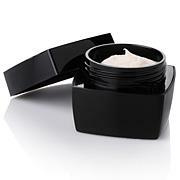 It is a very rich cream and I love it. Great for the dry weather we get in CA. I love this skincare line and glad to see it return. The secret to using it is to usea small amount. My skin feels wonderful after using it. I hope HSN will bring back her fragrances.....they smell like a spa and are wonderful. I would recommend this product and have given it to friends. leaves my skin hydrated overnight-need to use only a small amount and it is not greasy.